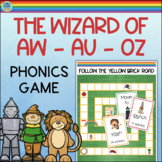 Follow the yellow brick road while learning words with vowel digraphs au and aw. This cooperative game requires students to read words with the target sound and determine which spelling pattern is being used: aw, au, o, or a (as in all). For 2 to 6 players. 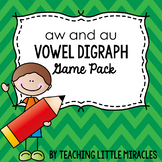 Also included in: Variant Vowels: Activity Pack BUNDLE! This is a set of 3 differentiated lists and 3 word work activities for each. This can be used for homework, centers, or practice on this spelling skill. Comes with a low level, on level, challenge list with a roll and write activity, word search, and cut and sort for each! 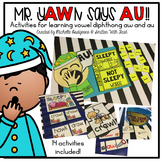 This is a sound sorting center activity that helps teach the vowel diphthong /au/ and /aw/. Students must sort race cars onto the correct race track. Trick cars must be correctly sorted into the garage. This jeopardy game reviews words that use the diphthongs au, aw, ou, and ow. The last slide of the game has a sheet that you can print off and have students write in the answers to each question. 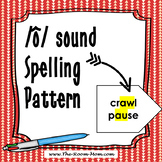 This is a fun way for students to practice spelling patterns. We like to play girls vs. boys. Students spin a spinner and land on au or aw. The kids read that sound out loud and then find a word on the board with that spelling pattern. If the student reads the word correctly they get to put their marker on the piece. The first student to get four in a row wins. 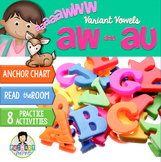 Vowel Digraphs aw and au - Barnyard Bust! AW AU Poem and Packet! 2 activities for words with vowel pairs. au, aw, oi and oy. 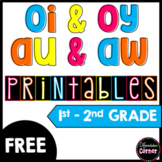 Students can use alphabet stamps to stamp the words and then write the words. Answer key is provided.